Apple juice like no other…. Quite randomly yesterday we had an absolute sell out on our juices. Clearly the customers up at the Norfolk Food Festival in the Forum needed refreshment! The joy of local suppliers, however, is that quite often you can give them a ring and they are round the corner somewhere! In 40 mins, the fridges were full again. 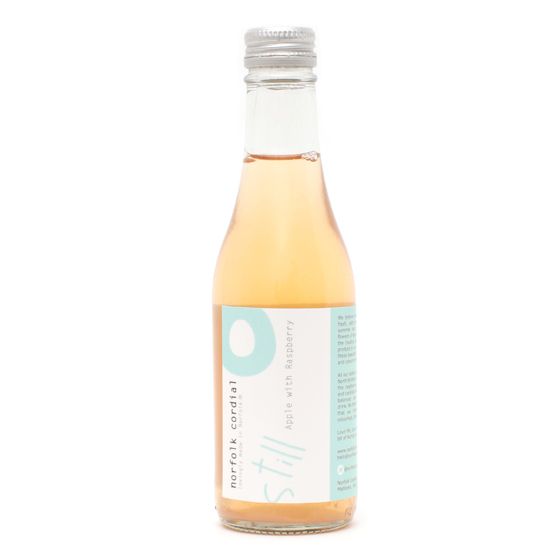 The quality of the ‘Norfolk Cordial’s apple juice which we stock, really does sell itself. When John (who with his partner came up with the concept) first came to meet us to talk about the product, I must admit I was cynical. What could possibly be so remarkable about an apple juice other than the fact you label it up as ‘Norfolk’ and use the word ‘natural’. But his passion about the product became almost inconsequential after tasting it. These were indeed luxury. Apple & elderflower, apple & raspberry and apple, rhubarb and ginger. Working with Norfolk farmers to ensure the ingredients are as fresh as possible, the drinks are made in small batches with the fruits and flowers seasonally picked by hand to guarantee it’s quality. No Colourings. No Flavourings. No Concentrates. No Preservatives. As we head in to Autumn, we are looking to offer these as warming alternative with rum. For now, whilst we eek out the last of the Summer, you must come an pop in and enjoy one with lots of ice and the papers. Norfolk Cordial also offer a range of real fruit cordials which are absolutely delicious. These are available to buy as a sample pack from Jarrolds deli, down at the end of Gentlemans Walk. They are also now stocked in Fortnum and Mason, should you be in that part of the world.